Oh, Christmas is getting closer!!!! 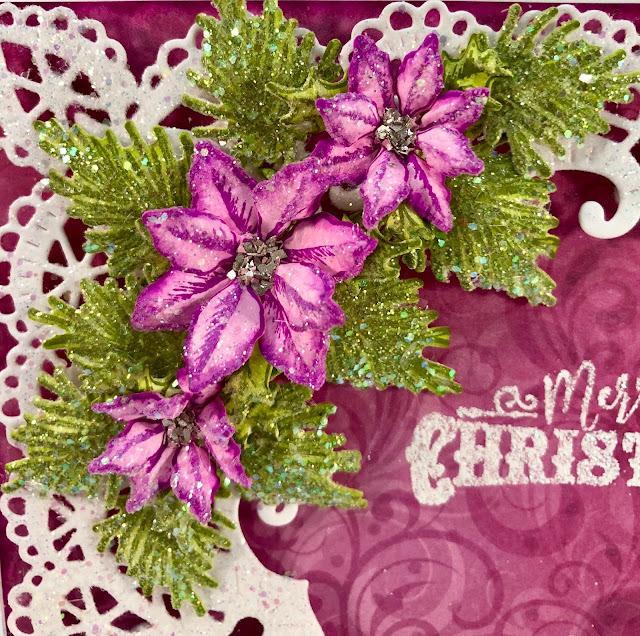 Here's another Christmas card I created that's just full of sparkle. Instructions: Card size is 5 x 7”. Cut white card stock 7 x 10”, score and fold at 5” on the long side. 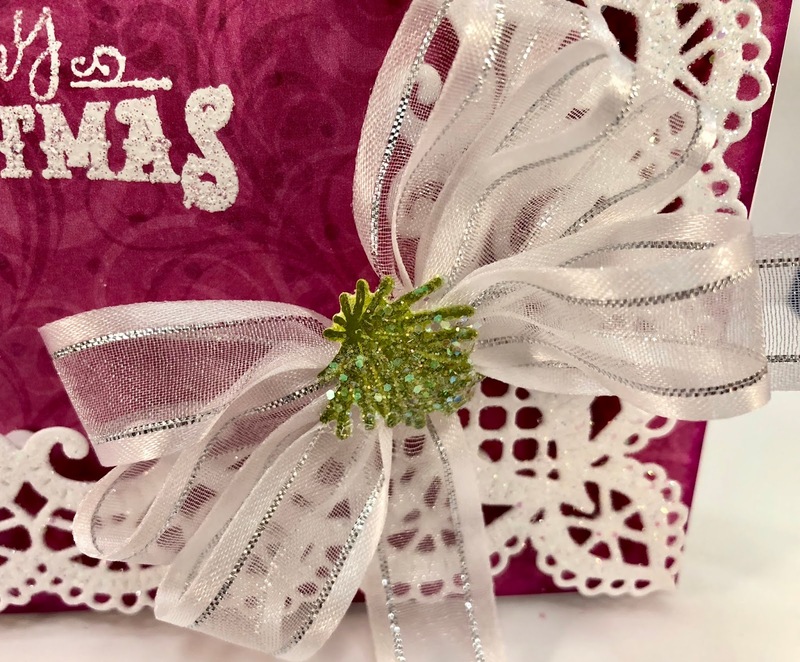 Cut a piece of designer paper 4 7/8 x 6 7/8”, ink the edges with Cactus Flower, stamp the sentiment with Frost White Ink, sprinkle with WOW Sparkling Snow Embossing glitter and heat set. Adhere to the card base with dimensional squares. Cut another piece of designer paper the same size, ink the edges and adhere to the inside of the card. 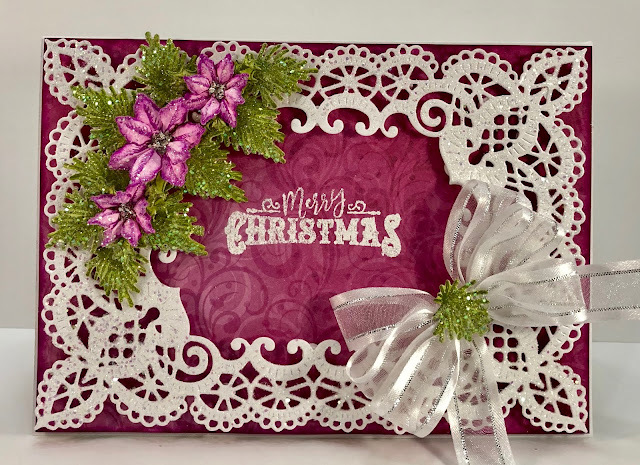 Cut from white cardstock the Eyelet Lace Frames Die, sponge with dries clear adhesive and sprinkle with Rajni Chawla’s Crystal Clear glitter. When dry, adhere to the card base using small dimensional dots. Stamp the pine leaves on white cardstock using Fern Green ink, color with Fern Green and Leaf Green inks, diecut with the coordinating dies and shape using the deluxe flower shaping kit. Sponge with dries clear adhesive and sprinkle with Crystal Clear glitter. Adhere the flowers and pine leaves to the card as shown using a hot glue gun. Tie a triple loop bow using the Bow-It-All 2, adhere with hot glue gun and add a pine spray to the center. Until we meet again, have a beautiful day! Oh Janet, your white lacey die over that wine color is so striking! 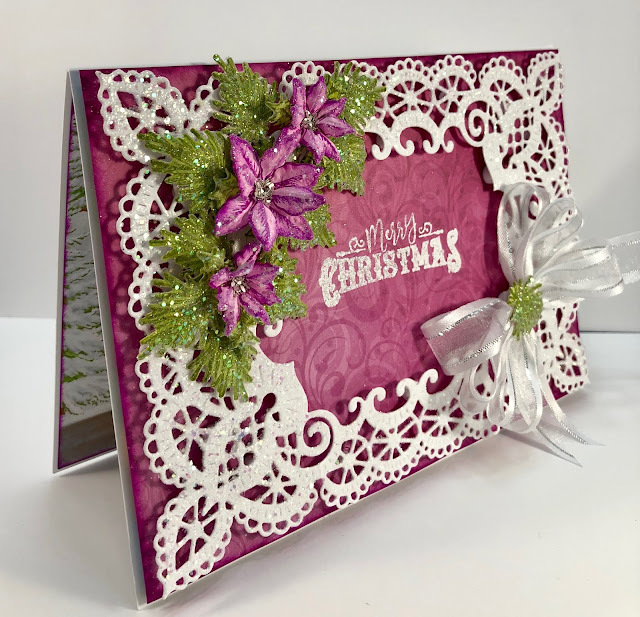 I love your card with those gorgeous poinsettias and beautiful bow! Everything is so beautiful! Thank you so much Robin! I so appreciate your kind words! What a gorgeous card Janet! Love the colours that you have used - they are stunning! Thank you so much for your kind words Patricia! Such a beautiful card, I love the gorgeous purple poinsettias! Thank you so much Darla!